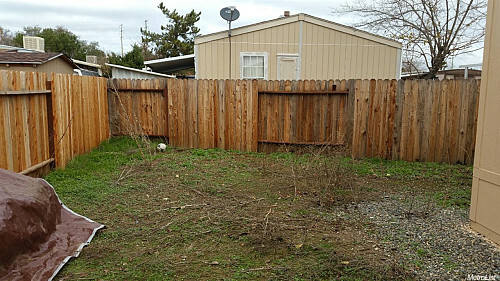 I just moved into this mobile home which has a yard. The “before” photo (at the bottom of this page) was taken a few months earlier and really doesn’t show just how bad it actually was. By the time I got ready to move, the yard was knee-high in solid weeds, so I definitely needed to get it done. For everything that I did to this place – because I did a lot of remodeling before I moved in – I went online. When I was looking for a landscaper, I went to another site first. All the contractors that came up were really big corporate type landscapers, though, and I decided that I didn’t want to go that route. So then I continued to do an online search. Your (Networx’s) website came up with Andy’s listing. He answered my call right away and said, “I can come out and give you an estimate.” He showed up on time, so it was a really easy online search. I had called a couple of the big corporate contractors that came up and they didn’t even call me back, because I think most of them were more interested in the big landscaping jobs than in my smaller space. So I didn’t get any other quotes, but I actually felt he gave me a fair price right up front. 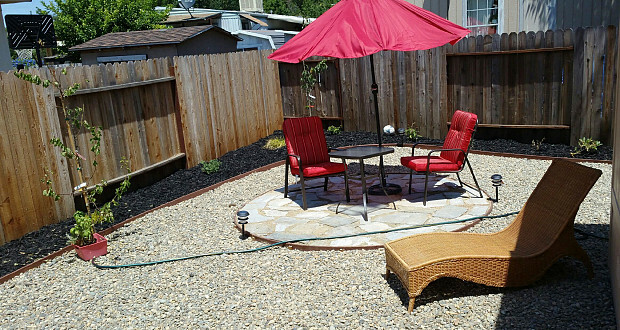 I checked out his customer reviews and I also had a pretty good idea from friends that had had landscaping done what to expect and about how much I was going to be paying, so I did as much research on him as I could. Right away, he took one look at the place and he knew what to do with it. I explained exactly what I wanted, that I wanted 4 different trees and some flowering shrubs and that I kind of liked a Zen look. In about 2 seconds, he gave me some ideas and a cost. He had a crew of a couple of guys, and it took them one whole day to get out all the weeds and prepare everything. Then they spent another day or so putting down weed block, doing all the landscaping and putting the rock in. It was about 2 ½ days altogether. We actually didn’t write up any paperwork or anything. I called him and said, “You are going to start work today, right?” and he said, “Yeah, we have a contract.” We shook hands on it. He was very honest. And he really delivered; I felt that right from the beginning, that he was going to get the work done. All the other contractors wrote up big contracts. But he just handwrote the page the day the guys came to do the weeds – what I was going to get for the money and the fact that I was going to pay half up front and half on delivery of the final product. It was quick, easy, honest. I’m happy with the results. It’s a small yard, but I’ve got an umbrella, a table, and 3 chairs. Andy put in drip irrigation for the plants and he put in 4 trees. So it’s a zero-maintenance landscape using very little water; in California that’s a big thing because we still have a drought. I especially love the rock. Andy let me pick it out and I wanted small river rocks, which rounded edges, because I have 2 little dogs and I specifically wanted that for their feet. I love it. It’s been really hot lately, but if I get out first thing in the morning with my 2 little puppies before it gets too hot and have my coffee out there, it’s great. The afternoon is too hot out there, because it’s 100+ degrees, but first thing in the morning it’s about 70, so that’s fine. Now my trees and shrubs are thriving and it couldn’t be better. He put in a great drip irrigation, which works perfectly and is already set up on a program so I don’t have to do anything. All I have to do is go out and enjoy the garden. What I liked about the Networx site is there’s some accountability. If contractors don’t do a good job, then they’re going to take the hit on bad reviews. So they really have to deliver. I felt very comfortable in all the work I had done going online and getting references online through sites like yours, because they have a responsibility not just to the client but also their own reputation. I’m a single older woman and I don’t know the first thing about contractors, so I felt really comfortable in using those sites. “Stealth” Tree Trimming Was an Incredibly Clean Job by Harold P.
Yard Clean Up Left Our Lawn Looking Fantastic by Todd W.